Rivers of icy wind swirled at my feet. The wet night snuck in through unseen crevasses of our old car and circled up my body – each gust, a laugh of hate against me and my mama who’d been living in and out of our car since I was 11. Those memories flooded through my mind as the soft voice of Myron Standing Bear, a member of the Oglala Sioux Nation, explained how he, a hard-working advocate in the community for 17 years, suffering with congestive heart failure, was living in his car with his two teenage sons. Through a story told by Myron, riddled with racial discrimination and injustice by the San Francisco Housing Authority (SFHA), that lasted several hours into that night, our revolutionary crew of legal and poverty scholar journalists began the lengthy process of documenting his case to transform it into our special blend of change-making media and in-your-face advocacy. “We don’t work with Indians,” SFHA had told Myron. He began his story with this, the first in a series of discriminatory and unlawful statements made to him by SFHA when they rescinded his place on the Section 8 wait list. The injustice began in August of 2009, when the family was informed of that their Section 8 voucher had been approved; they’d been on the list for 11 years. Upon finding a home, however, they were told by their SFHA worker that they were immediately being taken off of the Section 8 housing list, where they had reached No. 1 rank, and transferred to the Public Housing list, where they were placed at No. 564. Following this horrible beginning, an onslaught of discriminatory statements were made to the Standing Bear family while they tried to get housing justice. 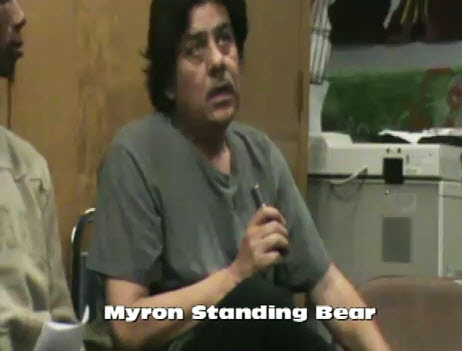 After our first meeting with Myron at POOR Magazine’s indigenous news-making circle in September, we wrote an article detailing Myron’s plight, which was published in POOR/PNN and the Bay View newspaper. Then POOR Magazine’s Revolutionary Legal Advocacy Project (RLAP) began to correspond with officials at the U.S. Department of Housing and Urban Development (HUD), who were embarrassed by the light shed on this situation. The result: In October of 2010, HUD re-opened an investigation into the wrongs committed by SFHA. “Myron and his family are outside, in the winter, in a car, with a fatal heart condition,” Lisa Gray-Garcia and Marlon Crump from POOR told HUD agents many times via phone and email following a meeting with HUD to re-launch the investigation. Several documents were demanded by HUD and produced, most of which were already in HUD’s possession because of a case started by Myron and his family several months prior. Myron and his family are outside, in the winter, in a car, with a fatal heart condition. Weeks turned into months. Myron’s condition was worsening. He and his boys were still in their car. On Nov. 23, we got the email: Myron would get his rightful Section 8 voucher. Myron, Mark Anquoe, a friend of Myron’s and tireless advocate from the American Indian Movement – West (AIM-WEST), and Marlon from RLAP at POOR all went to HUD on a beautiful day in the first week of December. The bright sun shone on their backs as they entered the lifeless building. Hope was alive for the Standing Bear family. Which brings me to back to mama. There were so many uncanny similarities between Myron’s family and my own. My mama, an indigenous Taino Boricua elder, had congestive heart failure; my mama was a tireless advocate for the community; and my mama and I spent most of my teenage years living in our broke-down hooptie. And then finally, when we had been on the SFHA wait list for a Section 8 voucher for years and had almost given up hope, my ghetto scholar mama fought the stagnant injustices of HUD and won, resulting in us finally getting a Section 8 certificate. Which is also why I am scared for Myron and his family: We couldn’t get a landlord to rent us an apartment to save our lives. Landlords often don’t want to touch Section 8 certificates with a 10-foot pole. Between the racist and classist stereotypes about “those kinds of tenants” – said more than once to me about Section 8 – to the paperwork required of landlords, it was impossible for us to get a place in the 90-day window they gave us to find a place. We looked every day, petitioned for a 90-day extension for the voucher, but still nothing. After our years together through endless poverty and houselessness, this was just another little murder of the soul, as my mama used to call it, and we gave up, remaining in increasingly unstable market rate housing, in and out of eviction until the day my mama passed on her spirit journey in March of 2006. Sadly, Myron’s family is not the exception, but rather the far too common norm for countless poor families caught up in the struggle to get affordable housing from a broken and dismantled system built on an Amerikkkan scarcity model that is not meant to house everyone and barely meant to house some. Families like me and my mama and Vivian and Jewnbug and Laure and Ingrid at POOR Magazine and so many other poor families in the U.S. This is the reason POOR is launching the revolutionary Homefulness project – a sweat equity co-housing model for landless poor families in the U.S. and beyond. In the meantime, Myron and his family must be housed. This is where readers and conscious landlords come in. You can make a difference. If you have a three-bedroom apartment or house available in San Francisco preferably or the greater Bay Area, please email POOR Magazine at deeandtiny@poormagazine.orgor call us and leave a message at (415) 863-6306. Those wet, cold winter winds currently remain Myron’s family reality as it was for my po’ mama and me. Let’s act as a community to change this piece of devastating herstory before it kills another landless poor family. Tiny – or Lisa Gray-Garcia – who describes herself as “poverty scholar, daughter of Dee and welfareQUEEN,” is the consummate organizer and co-founder with her mother of POOR Magazine and its many offspring and author of “Criminal of Poverty: Growing Up Homeless in America,” published by City Lights. She can be reached at deeandtiny@poormagazine.org. Learn more at www.tinygraygarcia.com/ and www.racepovertymediajustice.org/. Praying for this family that a suitable living quarters will be rentable to them soon.